Lonely Planet is offering its travel pictorial titles on the iBookstore for the first time. From today, readers can download Lonely Planet’s Best in Travel, The Travel Book and Lonely Planet’s Guide to Travel Photography as ebooks. The books can be viewed on an iPad, iPhone and iPod touch and are the first Lonely Planet guides to be released in Apple’s fixed-layout format, which retains the page layout, font and designs of the original print titles. To mark the launch of these ebooks, Lonely Planet’s Best in Travel is available for free, for a limited time, exclusively on the iBookstore. Further information is available at lonelyplanet.com. 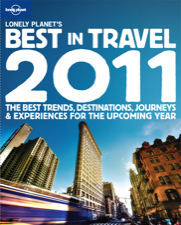 -Lonely Planet’s Best in Travel is available for free on the iBookstore from May 31 to June 14. – The Travel Book is priced at $17.99, Travel Photography is priced at $14.99 and Lonely Planet’s Best in Travel will be $4.99 once the promotional period has ended.